Two of the most useful reports for measuring and understanding the health of a business are its bal­ance sheet and the income statement. The bal­ance sheet summarizes a corporation's assets, what it owns; its liabilities, what it owes; and its net worth, the difference between the two sums at a given time. The income statement summarizes a firm's revenues, costs, and the difference between the two (the profit or loss) over a period of time. Accounting systems can vary, but the examples below are typical. Balance sheets usually are presented in the second form, with the assets on one side and the liabilities and net worth on the other. 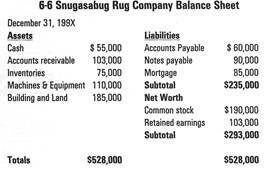 Table 6-6 is the balance sheet of the Snugasabug Rug Company. • Accounts receivable are the sums owed to Snugasabug by its customers. • Inventories are rugs and other merchandise the company has for sale. • Accounts payable are the sums that Snugas­abug owes its suppliers. • Notes payable are short-term loans owed by the corporation. • A mortgage is a long-term loan, usually used to finance a building. • Net worth is the portion of a company's assets belonging to its owners after its obligations have been met. Also known as Owners 'Equity, net worth is calculated by subtracting a firm's liabili­ties from its assets. Snugasabug had net assets of $528,000 and liabili­ties of $235,000, leaving it with a net worth of $293,000. Net worth also represents the original value of Snugasabug's common stock ($190,000) and the additional funds, or surplus ($103,000), that it acquired over the years. The Income Statement. The income statement, or profit-and-loss statement, shows how much a busi­ness has made or lost over a period of time (usually a year). 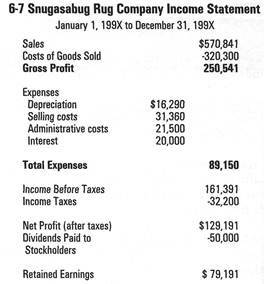 The income statement (Table 6-7) shows that Snugasabug sold $570,841 worth of its rugs. It cost the company $409,450 to produce and sell these goods, leaving it with a profit of $161,391. Out of this, $32,200 was paid in taxes, leaving Snugasabug with a net profit after taxes of $129,191. Snugasabug's board of directors voted to distribute $50,000 in dividends to its stockholders, while the balance of the funds ($79,191) was retained by the company and added to its surplus. Business firms can raise money from internal (inside) and external (outside) sources. Most internal funds come from profits. The principal sources of external funds are loans and sales of stock. Large corporations often raise funds through the sale of stocks and bonds. Bondholders lend money to the corporation and are, therefore, its creditors. Since stock represents part ownership of a corporation, stockholders are owners. Bondholders receive interest payments during the period of the loan, plus the face value of the bond at maturity. Stockholders receive a share of the profits in the form of dividends when and if the board of directors declares them. 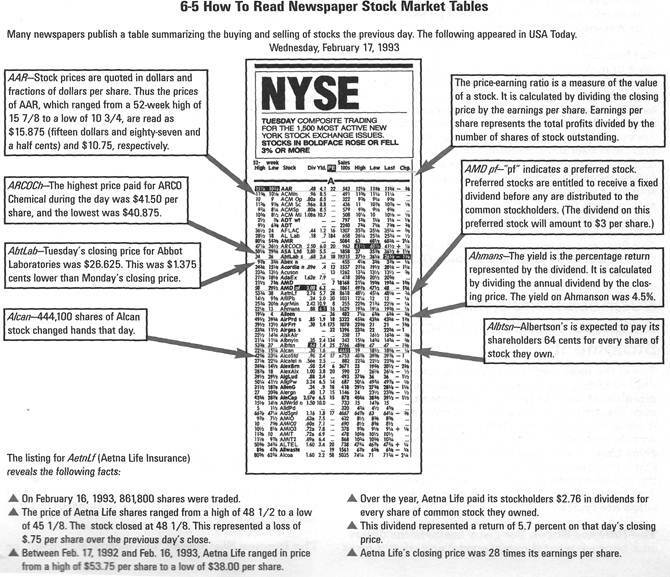 When stockholders sell their shares, they receive the shares' market value at the time of sale. Publicly held stocks and bonds are traded in stock exchanges or over-the-counter markets. Those who invest in corporate securities hope to make money from dividends, interest, or long-term growth in the value of their investment. Speculators buy and sell securities as values change. The government agency responsible for overseeing the operations of the securities markets is the Securities and Exchange Commission (SEC). The SEC subscribes to the principle of caveat emptor, "let the buyer beware." Investors and others interested in the financial condition of a firm can learn much from its income state­ment and balance sheet. The balance sheet describes a firm's assets (the things it owns) and liabilities (the amount it owes). The difference between assets and liabilities is the net worth. The income state­ment lists income and expenses. It provides information about the business's profitability. Many entrepreneurs use borrowed money to accomplish their goals. This is called leverage. Levers allow people to move much heavier weights than they could otherwise handle. In business, bor­rowed funds make it possible to increase the rate of return earned on an investment. Let's look at an example. Connie and Cal want to start a mountain bike rental business in a Colorado mountain town. They plan to pool their savings of $20,000 to buy bikes and cover other start-up costs. If all goes well, they expect the business to earn about 15 percent per year on their $20,000 investment. Their bank offered to lend them $40,000 at 10-percent interest for the venture. (At that rate, the loan would cost Connie and Cal $4,000 in interest charges: 10% x $40,000 = $4,000.) On the other hand, the loan would allow Connie and Cal to buy more bikes and advertise their business through­out the community and in tourist magazines. Leverage can magnify earnings. As long as interest payments on loans are less than earnings, leverage enables firms to magnify their gains. Suppose Connie and Cal accepted their bank's loan. Here's how leverage could work for Connie and Cal. The return on Connie and Cal's personal invest­ment will be even greater as a result of leverage! According to this scenario, by borrowing $40,000, Connie and Cal could increase the rate of return on their investment from 15 percent to 25 percent. Leverage can magnify losses. Now suppose Connie and Cal accepted the loan, but the weather in the Rockies turned damp and cold that summer, and few people rented Connie and Cal's bikes. As a result, none of their predictions come true, and they only receive a 5-percent return on their investment. How would this affect their earnings? The return on Connie and Cal's personal invest­ment was $3r000—the same amount they had hoped to earn without borrowing extra cash. However, since they had interest to pay, their business actually experienced a loss as a result of leverage! Remember, Connie and Cal planned to earn $3,000 without borrowing any money from the bank. What rate of return would Connie and Cal need to break even? Would you recommend they borrow the money? How about borrowing less? Why or why not? If Connie and Cal had a good year, their bank would probably extend their loan and even offer to lend them more money. On the other hand, after a bad year, the bank is likely to ask for its $40,000. Connie and Cal would be out of business. Borrowing money to start or expand a business is common. It can improve chances for success, but it can also magnify the risks. For hundreds of years, the science of astronomy was frozen by the theories of the second-century Greek astronomer, Ptolemy. According to Ptolemy, the Earth was the center of the universe. It was not until the 16th century that Galileo and Copernicus persuaded Europeans that the Earth, and all the other planets, rotated around the sun. In much the same way, the doctrine known as Say's Law slowed progress in economics for well over 100 years. John Baptiste Say admired Adam Smith's work, and through his Treatise on Political Economy (1803), he helped to introduce Smith's The Wealth of Nations to his native France. In explaining Smith's theories and the role of markets in satisfy­ing human wants, the author developed what came to be known as Say's Law. According to Say's Law, "production creates its own demand." In other words, people produce and sell goods and services to buy the things they want. If buyers no longer want certain products, sellers will stop producing them and shift to something that is in demand. Say's Law further explains that if only those goods and services actually in demand are produced t and managers and workers use the income they receive from the sale of those products to buy the things they want and need - then supply creates its own demand. In other words, there can be no such thing as overproduction or long-term unemploy­ment. Temporary overproduction and unemploy­ment can exist, but never long-term. The Great Depression of the 1930s, with its wide­spread unemployment and overproduction, finally put Say's Law to rest. Although some economists continue to agree with Say that in the long run the market will bring supply, demand, and employ­ment into balance, most agree with the British economist J.M. Keynes. Keynes argued that press­ing problems require immediate attention; we can't wait for long-term solutions.